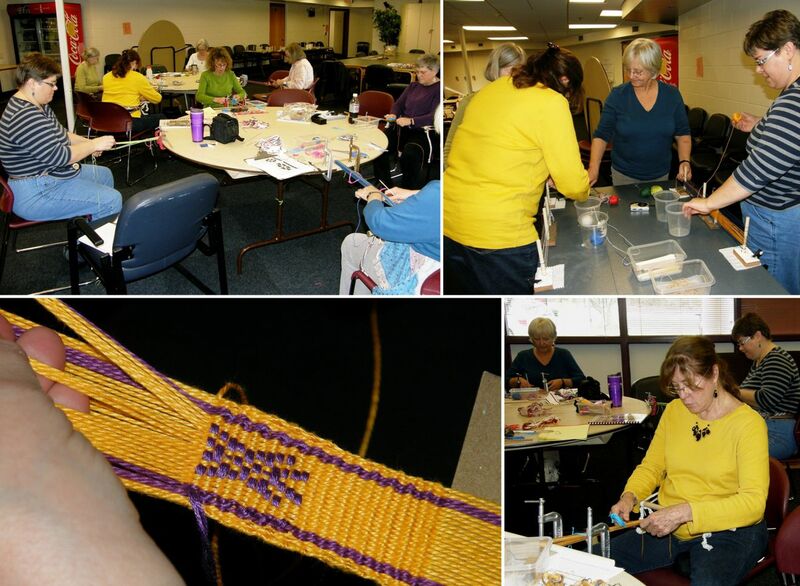 Backstrap Weaving – Time for even more Play! The last days were spent backstrap weaving with friends in Maryland. It was nice but confusing seeing many familiar faces at the guild meeting. Now…. 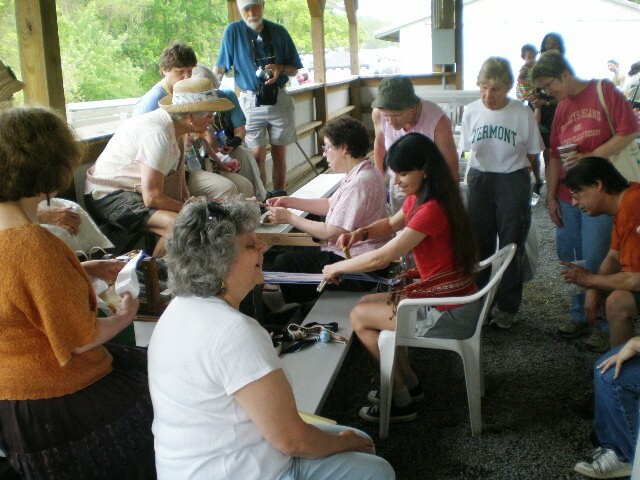 where did I meet these folks…was it at Sheep and Wool last year where Carla and Mary wove with me in the bunny barn or at the guild meeting I attended? There was one very familiar face…oh yes, that was Peggy who wove with me in Pennsylvania last spring. On top of that there were familiar names, if not faces, of people who have commented on my blog or Facebook page. And then there was Kathie! I spent three weeks with Kathie in coastal Ecuador in 2007 with the family of cotton saddlebag weavers that I have told you about here before. Although we have kept up a regular email correspondence since then, we haven’t been able to get together in person until now. She came along to weave with us. Above left, you can see Kathie on our visit to Ecuador in 2007 showing photos that she had taken when she first met this family back in 1976 and, above right, at our backstrap weaving get-together. I unwound with my friends in their home in Maryland and made plans for my last week in DC. Claudia is a weaver and Janet is a knitter so there were still plenty of fibery things going on around me. I learned about rag rug weaving from Claudia in her basement studio where she is in the process of making two 9-foot commissioned rugs. I was there to celebrate the finish of the first one. It’s quite a process!…cutting strips, sewing them together end to end, ironing them, winding them onto the long shuttles. I was glad to be able to help at least with the sewing and ironing and the sewing was novel for me…only my second time using a machine. While the machine is definitely the way to go for sewing those hundreds of strips together, I still prefer hand sewing for my little backstrap woven projects. When I arrived home, I cut the wildly colorful striped demo warp, that I had been carting around the US, off the loom. It had served its purpose, I didn’t really like it and I couldn’t face weaving any more of it. However, it didn’t go to waste as I was able to sew the small piece that I had woven into a new sewing kit pouch. I folded it in half lengthwise and sewed it together so you only see half the colors at any one time…a little less jarring than the way it looked with all the stripes together on the loom. 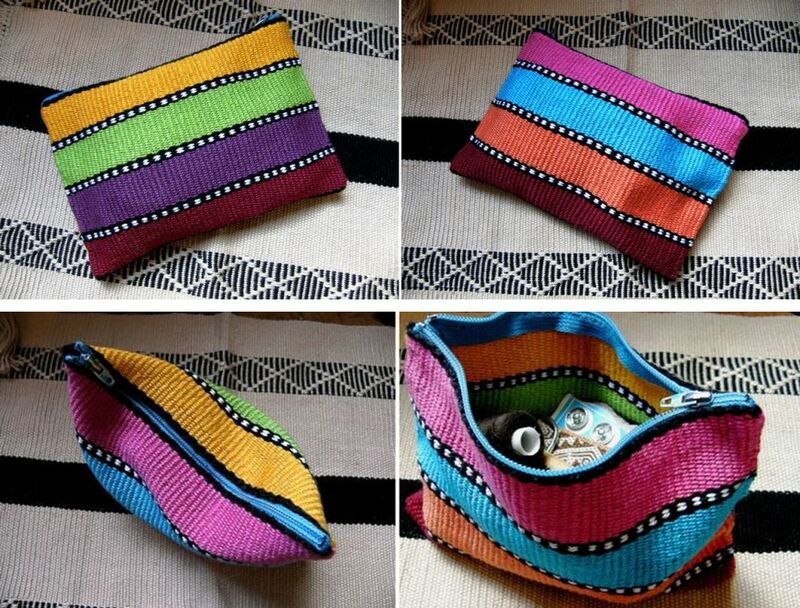 It is the perfect size for storing tape measure, scissors, needles, buttons and thread. I still have to finish off the sewing on the zip and you can see that the pouch is without the usual baubles and embellishments that I like to add. I think I will leave it this way. Now I have 26 loom bars standing up in their bins waiting for new warps and I have at least as many ideas floating around in my head for future projects! But anyway… back to play time in DC. A couple of emails arrived while I was at Claudia’s place. One from Mary told us about a Chilean handcraft exhibit at the National Museum of the American Indian which would include weaving demonstrations by a Mapuche weaver. The other was from Peggy who has woven with me a couple of times and who is a docent at the Textile Museum. 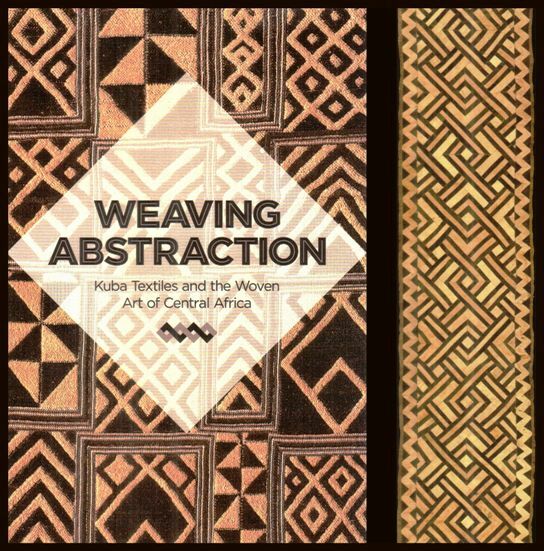 She offered to guide me through the current Kuba textiles exhibit on Wednesday which also happens to be the day the museum library is open. I jumped at the opportunity. Of course taking photos of pieces in the exhibit is not permitted but you can see above some the publicity material that the museum has put out showing a piece of raffia cloth on the left and bark cloth. 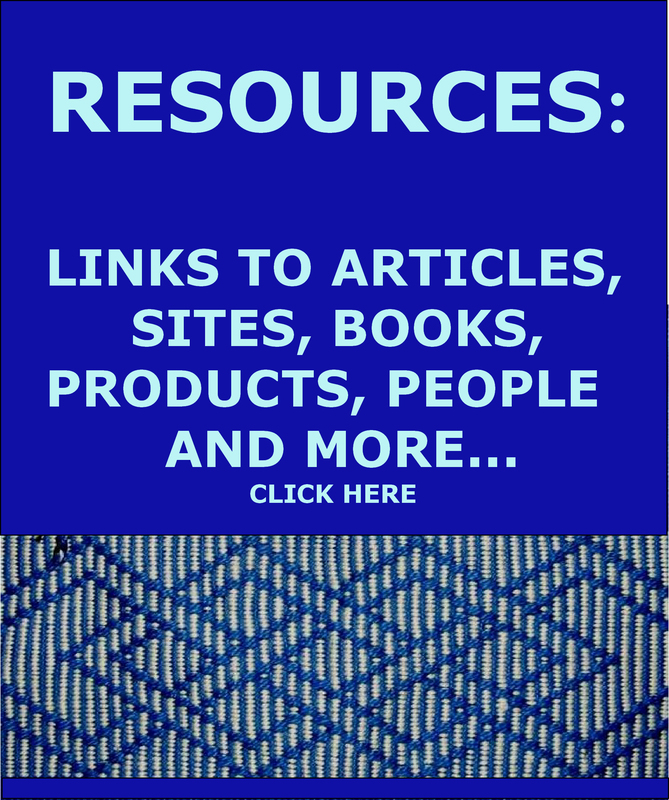 The picture at left of a Kuba raffia cloth weaver in the Congo is on Marla Mallett’s website where you will also be able to see quite a few images of raffia pile and embroidered cloth pieces. The Kuba Kingdom is a confederation of several groups of people in the area now known as the Democratic Republic of Congo. They were nomadic until the 1600’s and absorbed textile traditions from the Kongo people of the west coast as well as from the Tutsi and Hutu groups in the east. 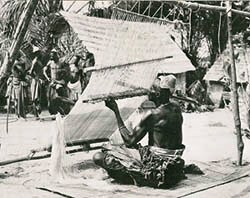 Men weave the plain-weave panels using fiber from the raffia palm. The cloth is then wet and pounded to make it flexible. The insertion of the colored raffia in a pile technique is the work of the women. The raffia is not knotted. 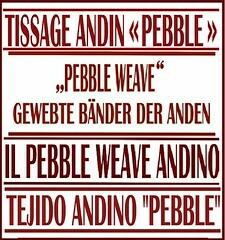 It is simply inserted under warps and/or weft and held in place by the tightness of the weave. The inserted raffia is then brushed with a knife which splits the fibers and creates a fuller more plush texture. I found myself surrounded by bold labyrinth-like and swirling patterns. The women also embroider along the edges of the pile sections. 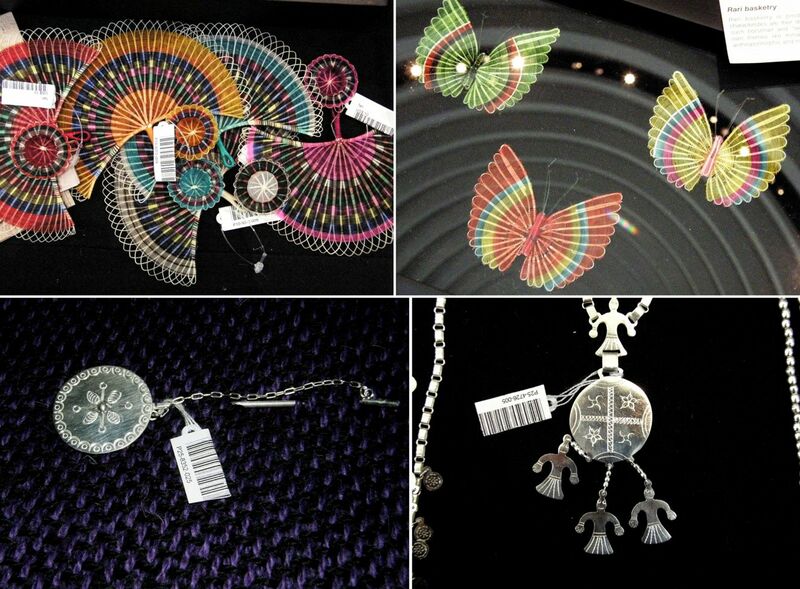 I was able to look at the back of the pieces that were on sale in the museum shop. Neither the inserted raffia nor the embroidery shows on the back of the cloth. One of the uses of the cloth is for ceremonial skirts that comprise many panels sewn together and which are gathered around the body. Smaller panels are used as overskirts by high ranking women while other small pieces are status cloths, amassed as symbols of wealth and nobility. There was bark cloth from the Bushong people, hats, caps and headdress of titleholders from the Kongo people that I can’t even begin to describe. I saw a delicate cape thought to be from Angola that looked like it had been made in sprang, tie-dyed cloth using sticks tied to the cloth to create the straight lines in the patterns, patchwork, reverse applique, embroidery and ornate belts decorated with beads and cowrie shells. 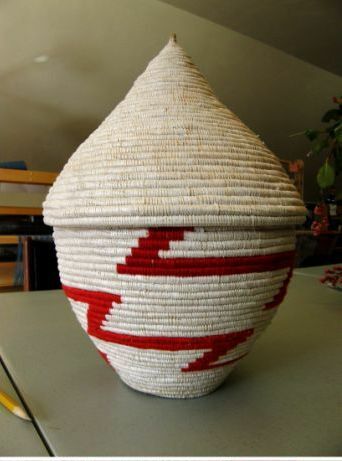 I loved the boxes and baskets with shaped lids which immediately made me think of the basket maker from Burundi with whom my friend Joan is working in Massachusetts. (see her piece pictured at left). Wouldn’t it be wonderful if she could be taken to such an exhibit?! 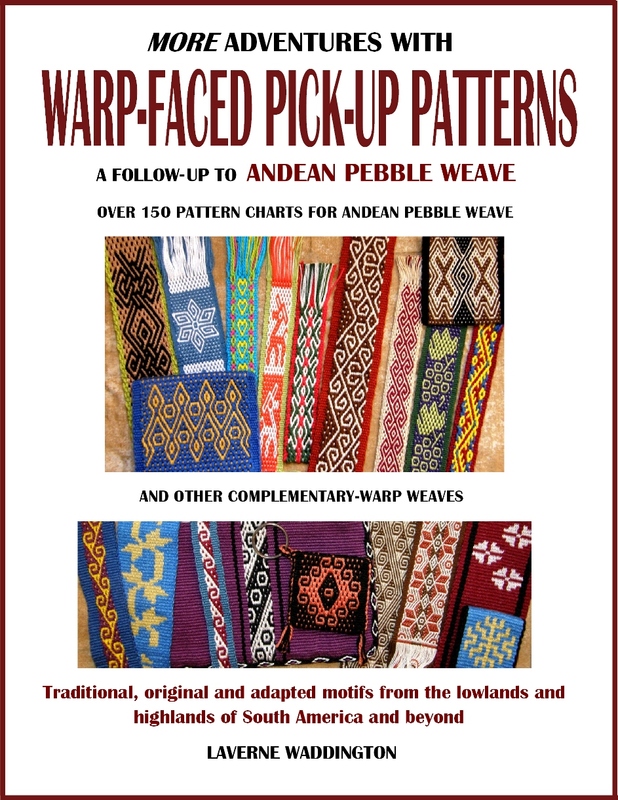 I bought the exhibit catalog and would love to use some of the motifs in double weave. That museum shop is a deadly place…I came away with the catalog as well as with Ann Rowe’s latest work on costume in highland Ecuador and a collection of papers on Andean weaving on sale for $5 while all the time wondering how in the world I would manage to squeeze this load into my luggage! The next day was all about Mapuche weaving at the National Museum of the American Indian at an exhibit called Chilean Rakizuam. 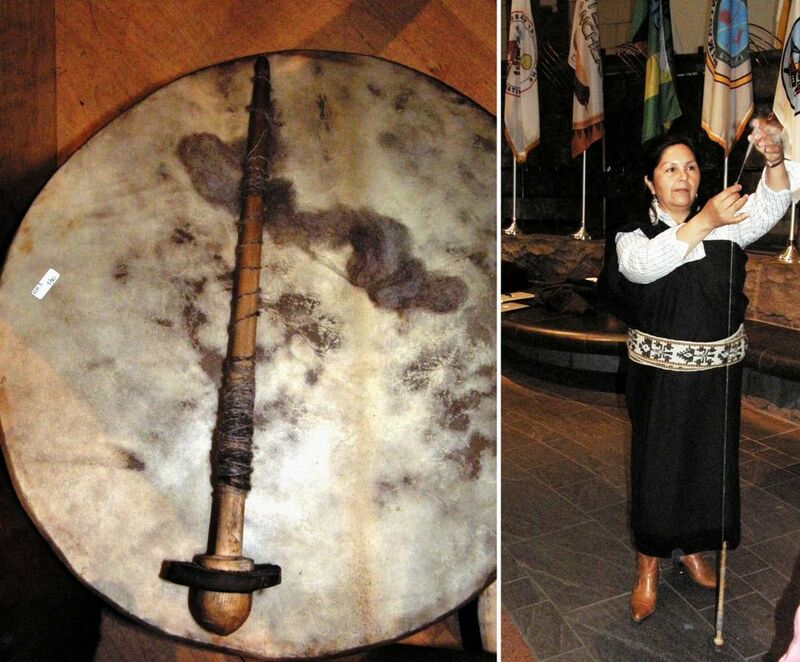 Rakizuam is the Mapuche knowledge of being, whether it pertains to the environment or an understanding of life that has been passed from generation to generation. It was quite nostalgic for me listening once again to the very distinctive Chilean accents of the exhibitors and the accompanying folk music. There was even a gentleman there from Punta Arenas, the country’s southernmost city, where I lived for five years. 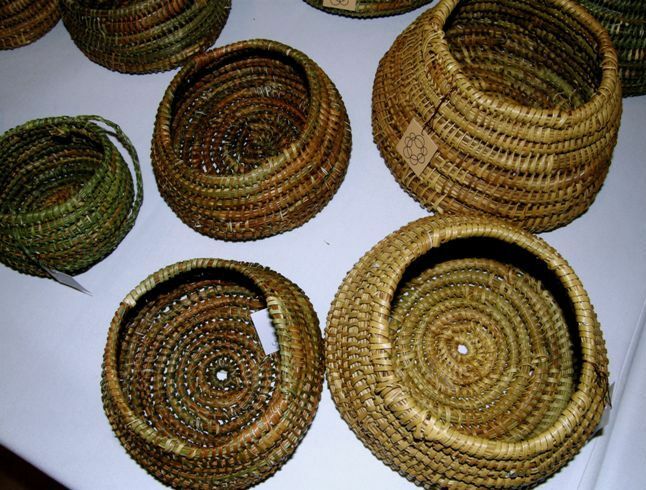 He brought baskets made by the descendants of the Yagan people as well as his own jewelry which combines pieces of coiled basketry with silver. When I lived in Punta Arenas there was one elderly pure Yagan woman still making the baskets who has since died. I still have one of the baskets that I bought back then. Other displays included pieces from the central zones of Chile south of Santiago…silver work with Mapuche motifs forming pendants and shawl pins as well as almost transparent figures woven from the hair of horses’ tails. The sturdy ribs in the figures are a plant fiber and the finer weft material is the crin, the hair of the horse or ox. And now I know that ”crinoline” according to Wikipedia was originally a stiff fabric with a weft of horse-hair and a warp of cotton or linen thread. From the central zone of Chile come pieces, such as the carved wooden stirrups above, associated with the huasos, the Chilean horsemen who also use a finely woven silk poncho known as chamanto. The exhibitors brought one of the striped examples which I have been told is called manta with the name chamanto being reserved for the ones that have been decorated with pick-up patterns. 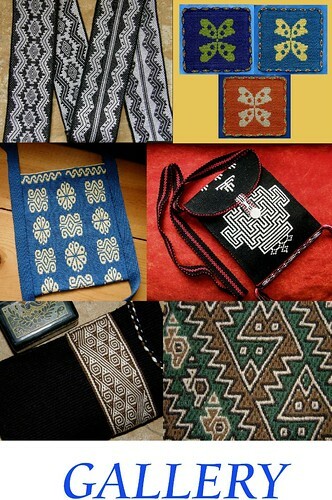 Representatives of the northernmost region of Chile brought jewelry which incorporated traditional weaving and looping techniques. Now there’s another use for the tubular bands! 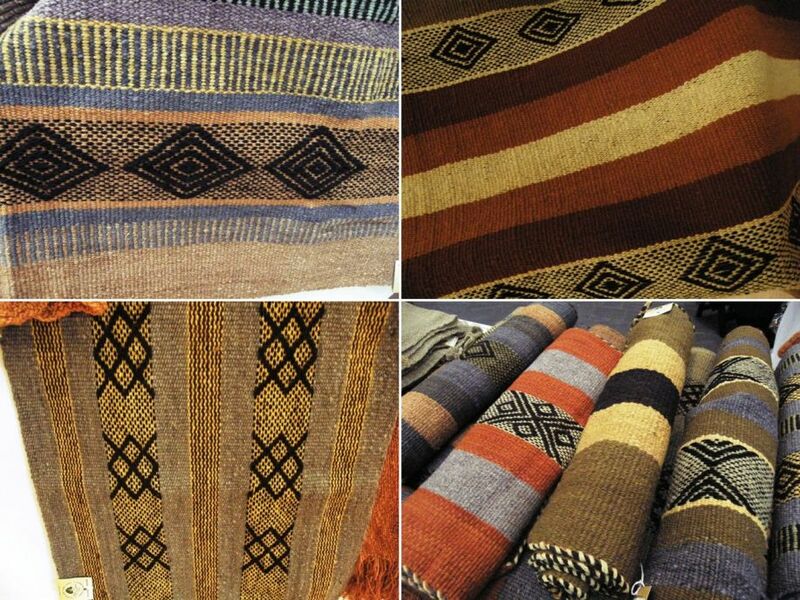 There was a variety of shawls, pillow covers and other woven household items as well as knitted apparel made with handspun and naturally dyed wool by Mapuche artisans. And the best part…a Mapuche weaver, Marta Isabel Huitraiñan Aillapán from Carahue, had been brought by the Chol Chol Foundation to demonstrate her weaving skills. While looking at the displays of woven pieces I spotted a spindle in one of the baskets that had been made for Marta by her son. She was quite happy to give me a quick spinning demonstration. And here is a video…soft lighting in the exhibit area has made the footage a little fuzzy. And there was the leaning vertical loom almost ready for Marta’s demonstration. You can see that the shed rod is fixed in place lashed to the posts of the vertical frame. The string heddles were made and tied in bunches to transport the piece to the US. 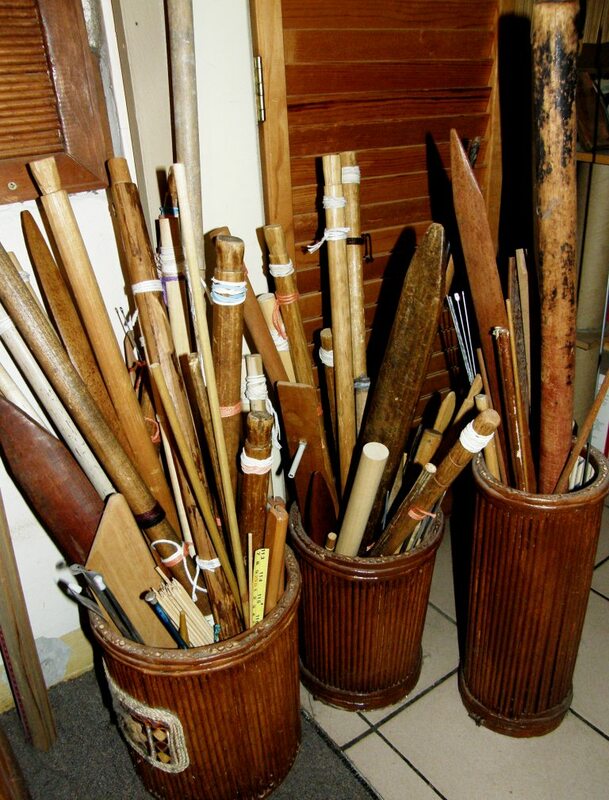 They will later be put on a heddle stick. 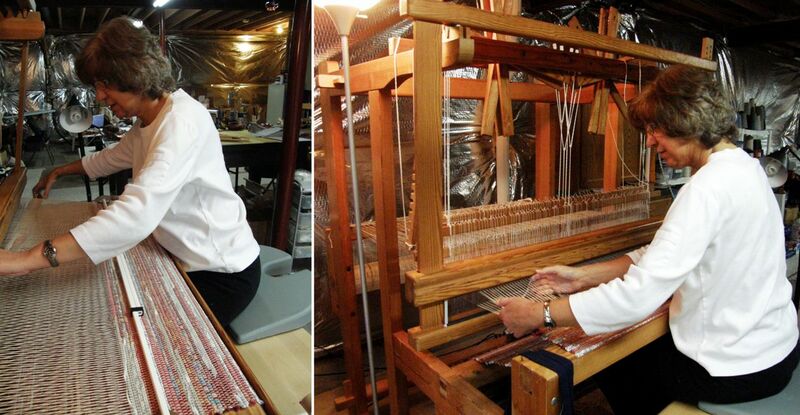 In the picture above, Marta is lifting the warps on the shed rod with her hands and clearing them through the heddles. You can see that the heddle stick is now in place and is protruding from under her right arm. The heddle stick rests against poles which are placed alongside the vertical posts of the loom frame which means that the warps in the heddles are in a permanently semi-raised position. 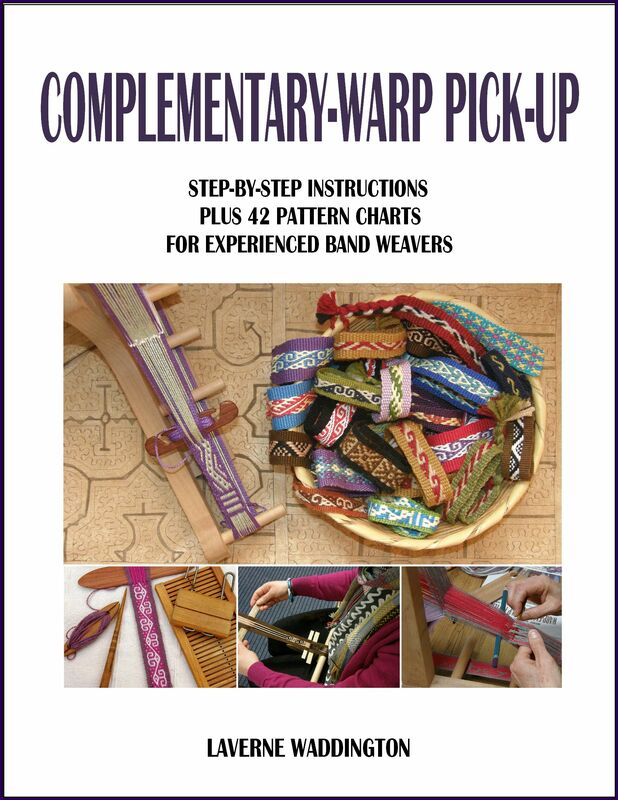 This means that Marta does not have to pull on the heddle stick in order to raise the warps in the heddle shed. By pushing down on the warps held by the shed rod, just enough space is created to allow her to get her fingers under the warps in the heddles and pull and fully raise them. You see that she holds the shed open with the sword in her right hand while picking up and dropping out the supplementary warps with her left. The tension on the warp and her beat are relaxed. The next day, after warping and weaving the supplementary warp piece above, Marta allowed me to help her warp for the complementary warp technique that is used to weave their belts. 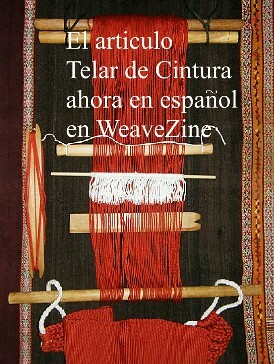 With the warp we made, Marta planned to weave a band with lettering (RDO DE CHILE…recuerdo de Chile, souvenir of Chile). I wove the letter “R” with her guidance and then, sadly, it was time to go. And once again twining enters the picture. 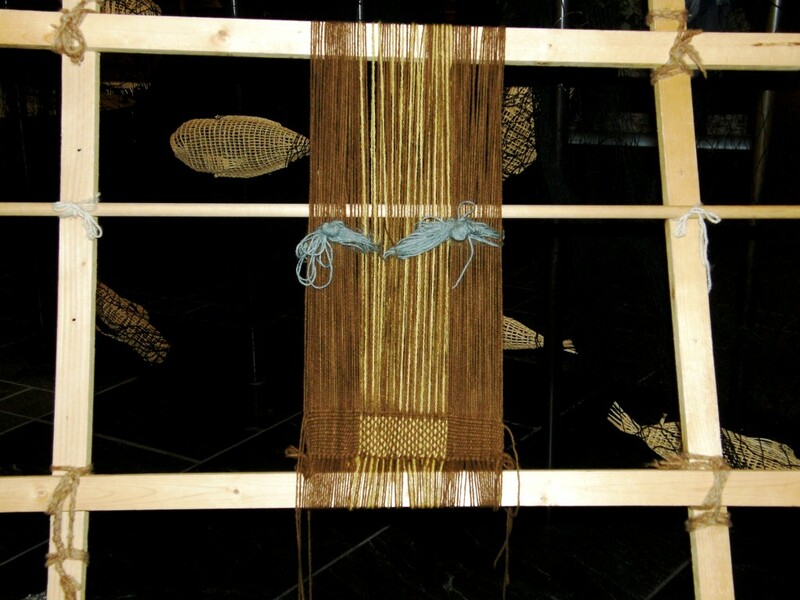 Marta starts and finishes her woven wall hangings with weft twining before braiding the warp ends or leaving them as fringe. On this narrow complementary warp piece we did not use a heddle stick but tied the heddles together in bunches instead and pulled on them to raise the warps. Marta was a great teacher for me – very patient – and says that she loves to show the process to people who are really interested. I don’t know how many times she answered the question from onlookers “How long does it take you to weave something like that?” I know that question well!! I was in very good company with Marta on the second day right up there at the loom! On the first day I was very much occupied with taking videos and photos when I suddenly realized that I should probably step back so as not be in the frame of other onlookers’ pictures. It was then that I noticed another particularly interested onlooker with camera in hand… Ann Rowe. So, spending time with Ann made day one even more special. Another great opportunity at the exhibit was being able to see, for the first time, one of the ikat patterned poncho pieces on the loom. I have always wondered just how the Mapuche weavers stop the warps from moving out of place while they weave ikat patterned pieces. They manage to reduce the characteristic blurry feathered effect on the edges of the designs to an absolute minimum. The result is beautifully sharp white figures on the dyed black background. The set-up on the loom certainly didn’t give away any clues! I was told that of the one hundred and fifty weavers that belong to the Chol Chol Foundation cooperative only one knows how to make the ikat-patterned ponchos. One thing that was missing was the double weave belts. I guess I shall just have to take myself off to Chile to see those. And happily now I have a contact in the Mapuche community. 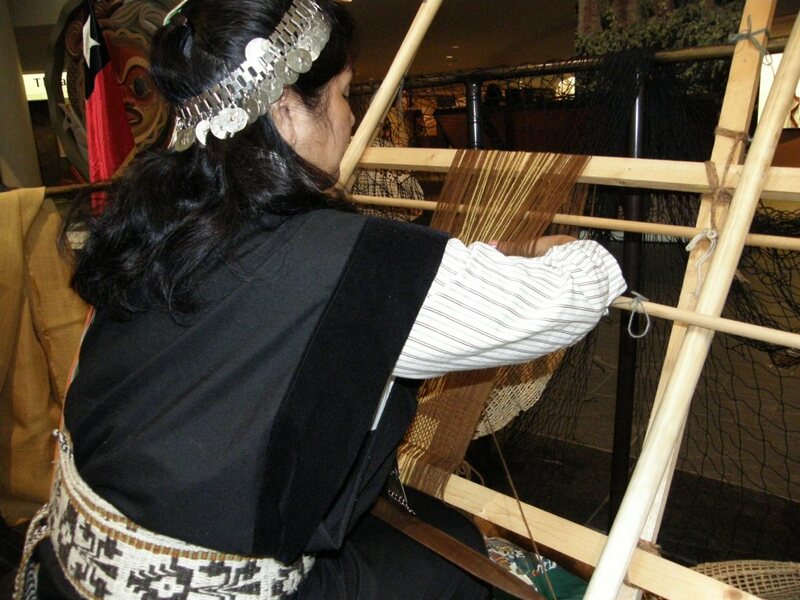 While I have been to Mapuche weaving exhibits before in Santiago, I have never been to one where I have been able to have so much interaction with the weaver. It would also be nice to visit with Celinda and Isobel, the Aymara weavers, that I met at the weavers’ gathering here in Santa Cruz earlier this year. And, if I need any more reasons to justify the trip, I could also go to Doñihue to learn more about the chamantos. So, here I am at home in Santa Cruz trying to get back into a routine, blogging one day earlier than usual to make up for the missed post last week. I send a big hello and hugs to all the people with whom I wove on this latest US trip and to all the people who so kindly took me into their homes. Now to decide what to warp up and put on the first pair of those 26 loom bars! I agree with Jennifer, a trip to Chile should be a “must do”! How exciting to be able to have that impromptu lesson, and meet Anne Rowe! Thank you for the videos, and the close ups of the spindle; what was that whorl made from? It looks like a large rubber washer! I love her technique, was she spinning from fleece or carded batts? That trip to the Textile Museum must have been the highlight of the trip! What a wealth of information, as usual! 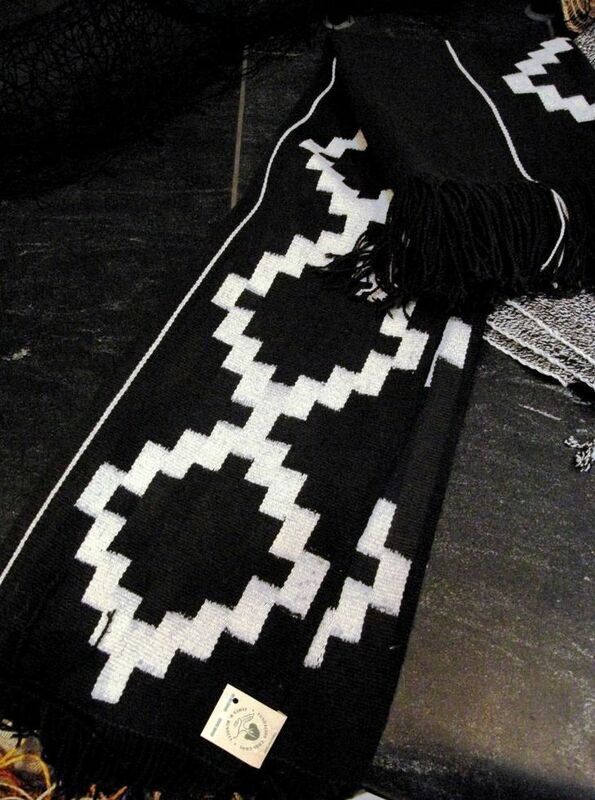 I think there is in fact a clue as to the regularity of the ikat pattern in the Mapuche poncho on the loom. If they weave it as shown, keeping the bindings on the warp yarns until the weaving comes within a few inches, this would help keep the edges of the resisted bits sharper. It seems like this would affect the tension, having those bundles in while the loom is warped, then released during weaving – but obviously the weaver has that under control somehow. I suspect that if they weave to within a few inches of the wraps it would be pretty hard to work the heddles and shed rod (kind of like finishing a four-selvedge piece) but maybe that is what it takes…a lot of discomfort and effort!I left my wraps on too when I wove it but I think mine may not have been tight enough and the warps were still able to slide. Wow! Do you know how to play! How wonderful that you found such interesting people and fiber experiences within your reach. The re-connection with Kathie and surprise meeting with Anne make it seem like your travels and experiences are not at all a chance, but part of a marvelous tapestry that you are meant to weave. You are often in the right place at the right time to make these connections and the rest of us get to benefit from from the stories and the knowledge you collect along the way.